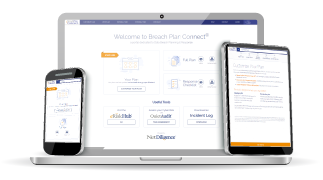 Breach Plan Connect® is an online platform that helps your organization build and maintain an effective Incident Response Plan (IRP). It helps risk managers think through the relevant pieces of an effective response plan and simplifies the plan-writing process. Our interactive “Build Your Plan” tool guides you step-by-step in building a practical plan for managing data breaches and other cyber incidents, including helpful tips and default verbiage that you can easily customize. Unlike a dusty plan filed away in a cabinet somewhere, this living platform is easily accessed at any time, from anywhere, on any device. Quite literally, it “connects” all the key players inside your organization, keeping them informed and engaged with best-practices incident response. For more information, download our brochure or email us at support@breachplanconnect.com. This site is operated by NetDiligence®. Links found within this site may open a new browser window and take you outside the Breach Plan Connect to another website, the contents of which are maintained by third parties over whom NetDiligence has no control. We provide links to these external sites for your convenience and awareness. We accept no responsibility for the content of linked sites. Upon request of the content source, we will remove links. You have been logged out for security reasons. Please log in again.